See only the best of Chicago while avoiding the crowds. Your ultimate weekend travel guide for a family trip to Chicago with kids! During our time traveling in Chicago, Chris and I have explored all of the big tourist spots. We’ve figured out what’s worth seeing and what’s not. Oh, and let’s not forget Trevor! Tru, age two, is the newest addition to our family. He joined us on our most recent trip to Chicago. So now we can also say, with confidence, what works best in terms of seeing a huge and crazy-busy city with a young child in tow! Our goal with this weekend itinerary is to help you to see all of the most incredible and scenic spots in Chicago. All while avoiding difficult commutes from point A to point B (because that’s just a recipe for meltdowns, for both kids and their parents)! And all while avoiding insane crowds (because that’s another recipe for meltdowns). We’ve also tried to include a good mix of sites and restaurants that appeal to both kids and parents too! Because everyone in the family deserves to have some fun in Chicago! So we recommend kicking off your arrival to beautiful Chicago at one famous Chicago landmark that we think is completely worth the hype: Lou Malnati’s Pizzeria. Chris and I love the pizza from Lou Malnati’s. Their famous deep-dish Chicago crust is super crispy on the outside yet soft in the center, with a rich buttery flavor. Another distinctive difference in Chicago deep-dish pizza: cheese is layered on first, then a savory tomato sauce on top! Chicago is my second favorite destination for pizza, after Italy. Lou Malnati’s is that good. The one problem: lines can get crazy long here, with wait times of more than an hour. So here’s what we recommend: eat a very light breakfast and lunch. Then head to Lou Malnati’s for an early dinner, at about 3:30 or 4pm. With any luck, you’ll miss the lunch crowd but beat the dinner crowd! True, Navy Pier can get really crowded with tourists. And yes, it’s full of souvenir shops and fast food. However, we had to include Navy Pier on a family weekend itinerary because it was one of Trevor’s favorite spots in Chicago. Inside, there’s the Chicago Children’s Museum. And a gorgeous indoor botanical garden, called Crystal Gardens, that’s filled with palms and tropical flowers. Outside, there’s a splash park, a swing ride, a carousel, even remote control boats (Trevor was fascinated with the boats). In other words, it’s a dream destination for kids. But here’s what I love best about Navy Pier: the massive Ferris wheel called Centennial Wheel. Centennial Wheel offers the best city skyline views of Chicago. I’m not going to recommend visiting the Willis Tower Skydeck in this weekend itinerary. The crowds are just so over-the-top there. We visited during a very slow period, and wait times were still about 45 minutes. It’s just too much for young kids. But when we rode Centennial Wheel during sunset, I discovered some of my favorite views of Chicago. And, we enjoyed the scenery all from the peace and calm of our own private gondola! Our best advice: head to Navy Pier in the evening, after the heaviest crowds and midday heat are gone. And stay until after sunset. Navy Pier is a safe and family friendly spot to take in the beautiful Chicago city skyline, all lit up after dark! Lincoln Park, in my mind, is one of the most stunningly scenic parts of Chicago. I loved taking photos here. The gardens were so vividly colorful and peaceful. Here’s what I also loved: Lincoln Park feels worlds away from the chaos of the busy city streets. Huge cities like Chicago can be tough on little kids. Trevor, age two, really wants independence these days. So he constantly fought having to hold Chris’s and my hands as we made our way through crowded Chicago sidewalks. Once we arrived at the gardens surrounding Lincoln Park Conservatory, Trevor had the time of his life running free around the flowers and fountains. The gardens inside the Conservatory are also fun to explore. They’re very serene, filled with orchids and palms. After exploring the park and gardens, find the Lincoln Park Zoo right next door. Trevor loved wandering the tree-lined pathways and checking out all of the wildlife at the zoo. There were lots of exotic animals like monkeys, kangaroos, zebras, lions, and giraffes. Plus birds, reptiles, seals, even farm animals. Since the zoo is located near conservation land and a park, the area is stunningly beautiful too. Plus, in addition to the animal exhibits, the zoo offers carousel and train rides for kids. There are also several cafés for lunch. If you have young kids, you’ll probably spend your early afternoon like we always do. Back at the hotel for resting and napping! But, if you have older kids, we highly recommend checking out the The Art Institute of Chicago. Just the building itself is stunning, inside and out. It’s a historic Beaux Arts building that was first opened in 1893. And the art collection here is vast. You can view artwork from every corner of the world, from Medieval art to Pop Art, from Renaissance sculpture, to fashion, to photography. We saw so many famous works by world-renowned artists here, including van Gogh, Picasso (shown above), Matisse, Monet, Renoir, O’Keeffe, and Warhol. Some of the most recognizable works at The Art Institute are “A Sunday on La Grande Jatte” and “American Gothic” (shown above, painting on the right). For early evening, we recommend enjoying Chicago Riverwalk. Riverwalk is a scenic, pedestrian-only walkway that stretches for over a mile along the Chicago River. We think it’s one of the most family friendly ways to wander downtown and take in that stunning Chicago architecture. There are handfuls of options for boat tours departing from Riverwalk. But, with an energetic toddler, Chris and I preferred to explore by foot. Riverwalk is a bit removed from the chaos and noise of the city streets, which is a nice convenience for families. And Trevor definitely recommends making a stop at the Ghirardelli Ice Cream and Chocolate Shop when you get tired of wandering! This particular Ghirardelli location is in a gorgeous building with nice views of the city and the Chicago River. More importantly: they’ve got yummy sundaes with the best chocolate fudge! For dinner, we highly recommend The Little Goat Diner. On the night we visited, the atmosphere at The Little Goat was casual, noisy and lively. And the sandwiches, burgers, and fries were all incredible! Yes, Cloud Gate (i.e. “The Bean”) is one of the most well-known landmarks in Chicago. But did you know there’s a spot to view Cloud Gate, from above, without the chaos of hundreds of selfie-taking tourists? Chris and I loved this place! Cindy’s was definitely an upscale restaurant, so we weren’t sure we’d feel comfortable with a toddler. But Cindy’s has a casual atmosphere, and they’re welcoming of kids. In fact, there was another family with a young child seated at the table next to ours. Tip: It’s tough to get a reservation at Cindy’s, so book a table as far in advance as you can. We tried to get a reservation a couple of weeks in advance, but we were too late. Arrive at Cindy’s about ten minutes before the restaurant opens for the morning (Cindy’s opens at 10am for brunch). There will probably already be a line when you arrive! But they’ll begin seating promptly when the restaurant opens. As long as you’re in line at opening, you should get a table. After brunch, cross the street and enjoy Millennium Park. Maggie Daley Play Garden is right beside Millennium Park, and it’s a huge, dream playground for kids with lots of slides, tree houses to climb, and suspension bridges to cross. Just beyond Millennium and Maggie Daley is Grant Park. 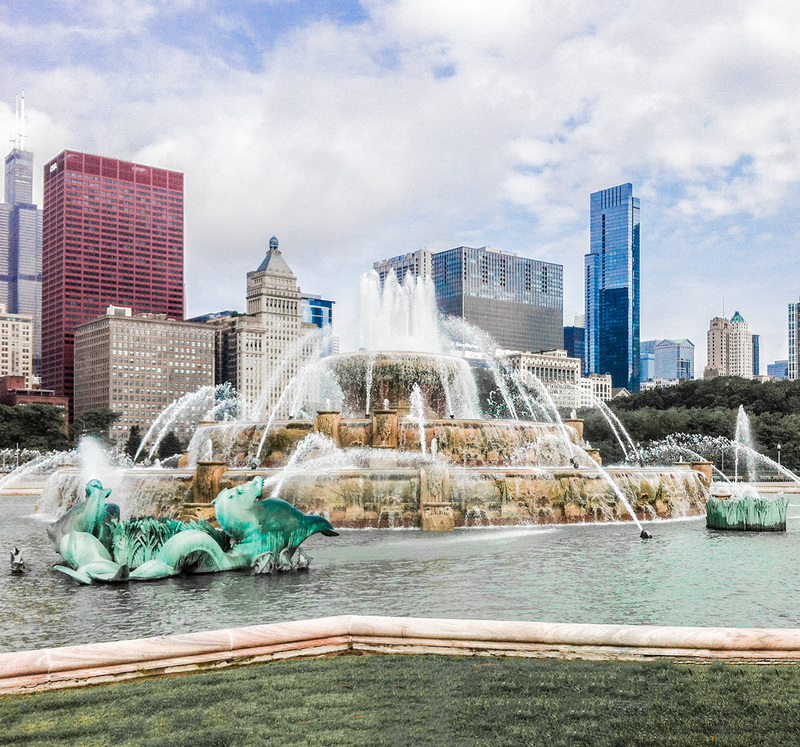 Grant Park is where we found this enormous and beautiful fountain, called Buckingham Fountain. It’s the perfect spot for family photos! You’ll know you’re in for a treat as soon as you step into the lobby of The Field Museum. The building is stunning, with elegant columns and domed arches and sunlight cascading through a gorgeous glass ceiling. Meanwhile, a massive dinosaur fossil towers above visitors and, suspended from the ceiling, a giant “chandelier” is covered in live greenery. The Field Museum is known as one of the largest natural history museums in the world, and it’s a must-see for families traveling to Chicago! There are enough collections and exhibits – from gemstones to meteorites – to keep a family busy for a full afternoon. One favorite for Trevor was the Ancient Egypt exhibit, which had a three-story replica of an Egyptian tomb. He also loved the Evolving Planet exhibit, which had lots of interactive activities and dinosaur fossils. Plus fossils of other incredible creatures like this “Giant Ground Sloth,” which lived about 1 million years ago!